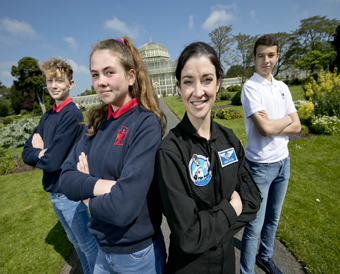 The BT Young Scientist & Technology Exhibition (BTYSTE) has just announced a partnership with Dr. Norah Patten, Ireland’s astronaut in training, as she prepares to take part in her first international moon analogue mission from 14th-29th July. Dr. Patten, who will be representing Ireland on the mission, will be joined by six other crew members from Romania, Australia, Egypt and Canada. The analogue mission, which is the undertaking of activities on Earth in environments which simulate aspects of human missions to the Moon, and other space environments, will take place in a research laboratory in Pila, Poland. (Pictured Dr. Norah Patton with students from Sutton Park, Dublin who have submitted their projects for consideration during the mission).